In the remote, high elevation, desert landscape of Utah the clarity of the night sky is some of the best on earth. Always present but hidden to most by urban light pollution, the Milky Way passes overhead and is one of the most beautiful natural wonders one will witness in their lifetime. This stone archway, known as Mesa Arch, was formed from millions of years of erosion yet it's merely an infant when you compare it to the Milky Way on the galactic clock. During a certain time each year the Milky Way rotates into alignment providing a rare opportunity to capture both heaven and earth in symmetry...as above, so below. This heavenly scene was captured in Canyonlands National Park, at Mesa Arch. This image is made up of 24 separate images, equating to about 345 megapixels for the full photo. 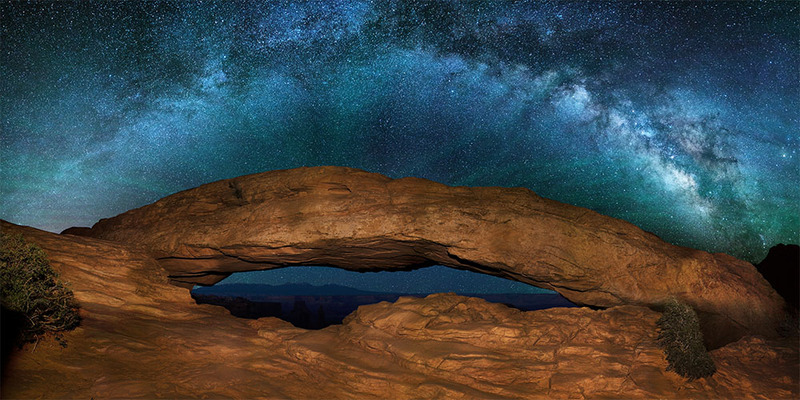 The panoramic view lends some "arch" to the Milky Way as well as provides stunning detail of this unique scene.